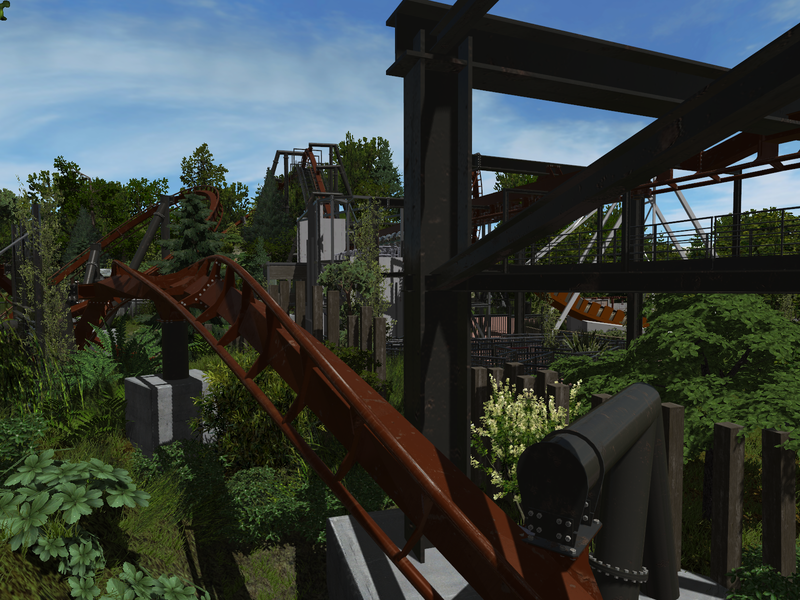 The Hard Hat Area is the place to post construction news about your ride, so this is the place to hype your future upload! I have some good news and some bad news. 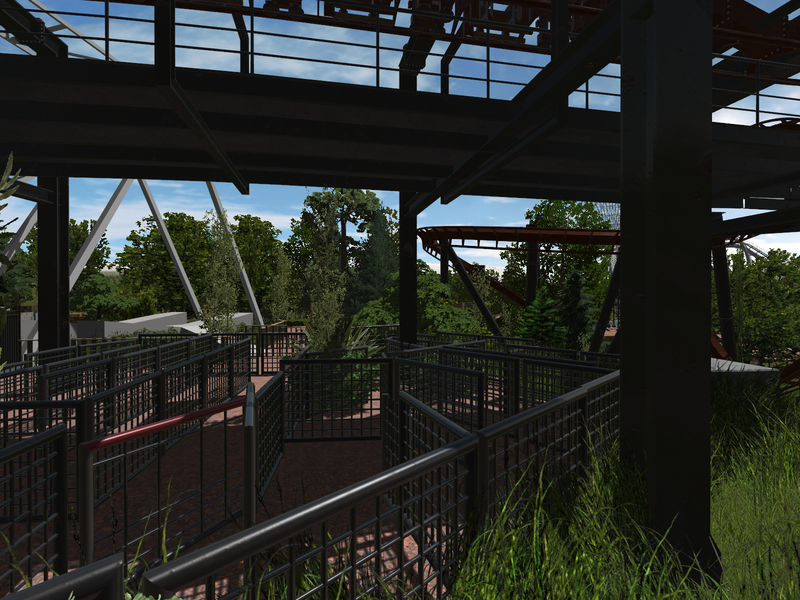 The bad news is that my last park has encountered a texture issue, so is on hiatus until I can fix it and repair it. 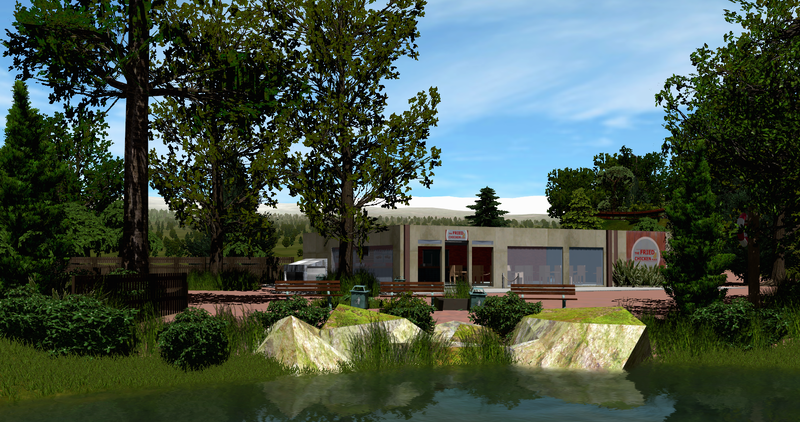 The good news is that I have began work on a new park! Here are some screens of the progress so far! Last edited by Bouncypip11 on September 8th, 2015, 12:43 pm, edited 2 times in total. Looks nice so far! 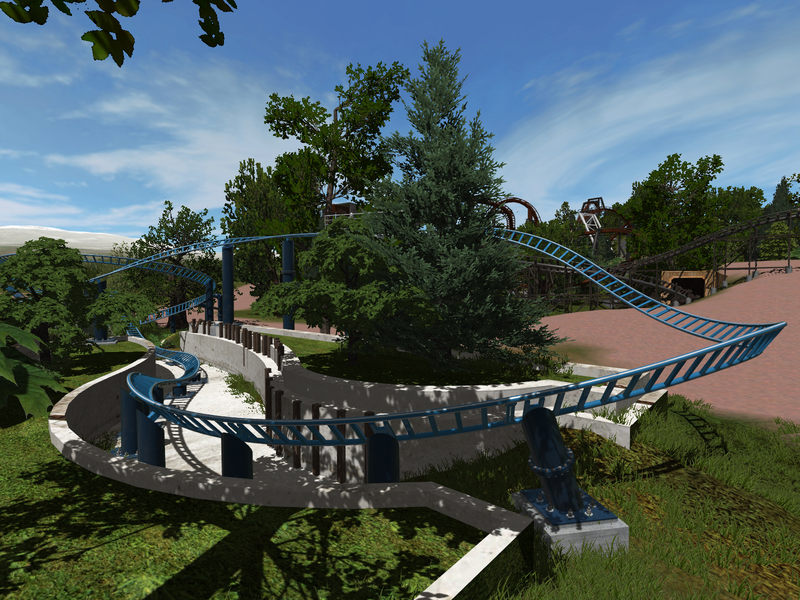 Interesting layout as well with that vertical loop so close to the end of the ride. Gutted to hear about the other project but this looks really good! 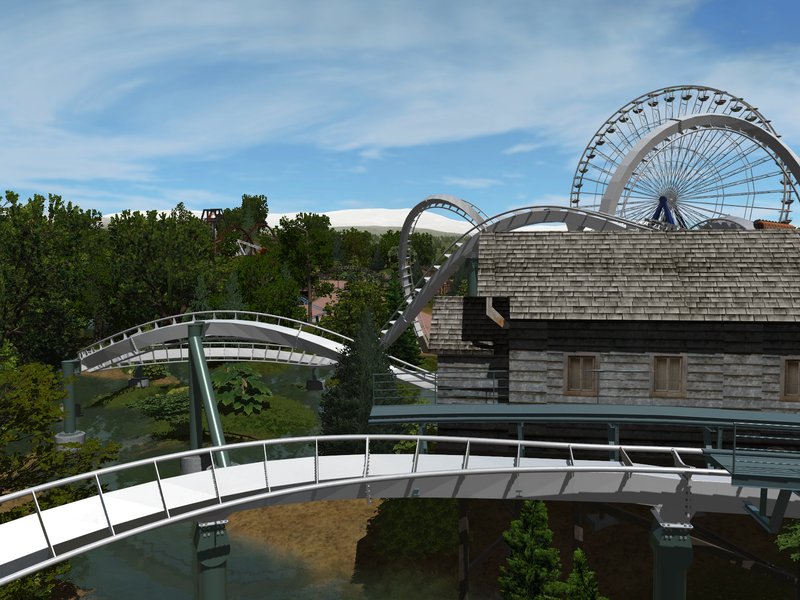 As I said before the colour scheme is really cool and now we've got a better look at the ride it looks great! That overbank somewhat reminds me of a larger Black Mamba element. Your attention to detail is impressive, and I like that near inversion element. I would look at reshaping your lift crest though, it looks pretty awkward and gross right now. All I can say is this is "Nemesis and Nemesis Inferno" inspired! I've been re-shaping parts quite a bit and will work on the lift crest. It is indeed very heavily inspired by nemesis. 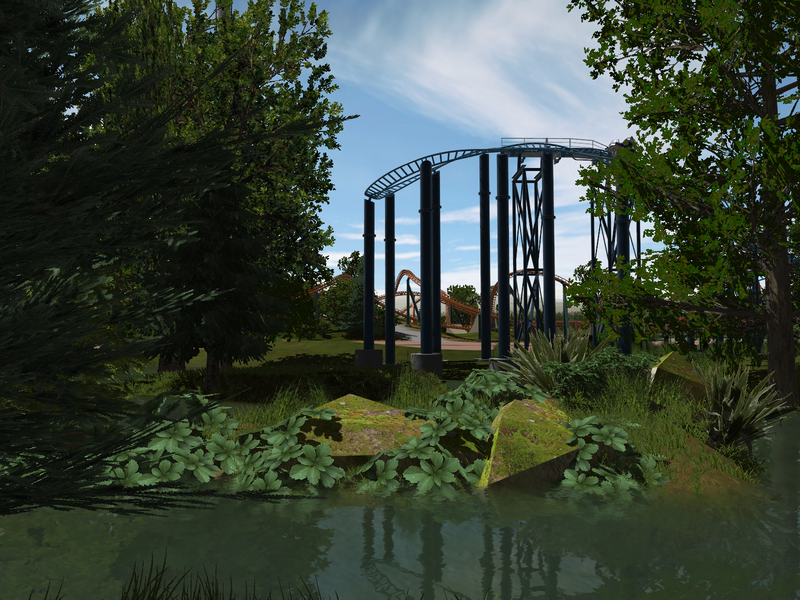 I love the dense vegetation and terrain/surrounding interaction. 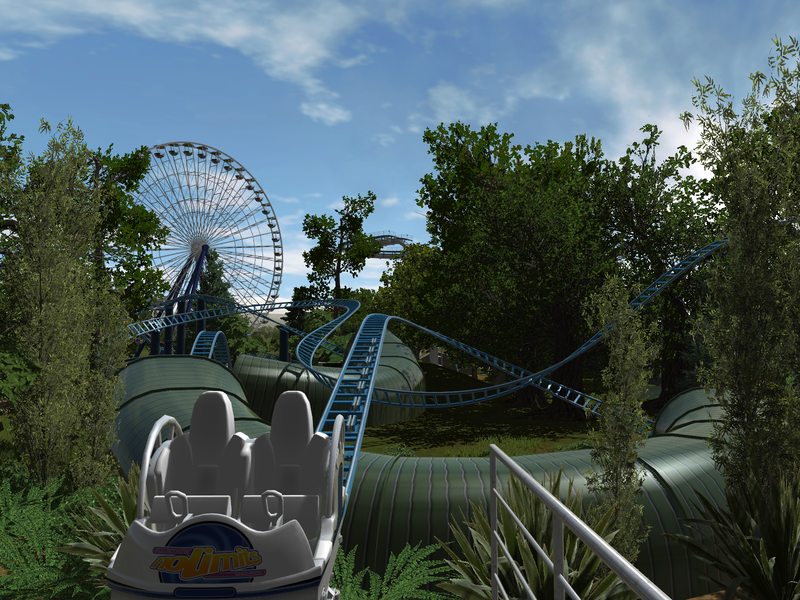 It's always cool to be in a queue and be right next to the coaster and also makes the area feel a lot more immersive. The colour scheme accidentally ended up a little like inferno's, but it looked much better than my previous grey and black scheme. I'm getting a Jurassic feel from this. Tall trees (They really stick out!) are I guess, making that area look Jurassical! I think it's the various foliage for sure. Still lookin' sweet! 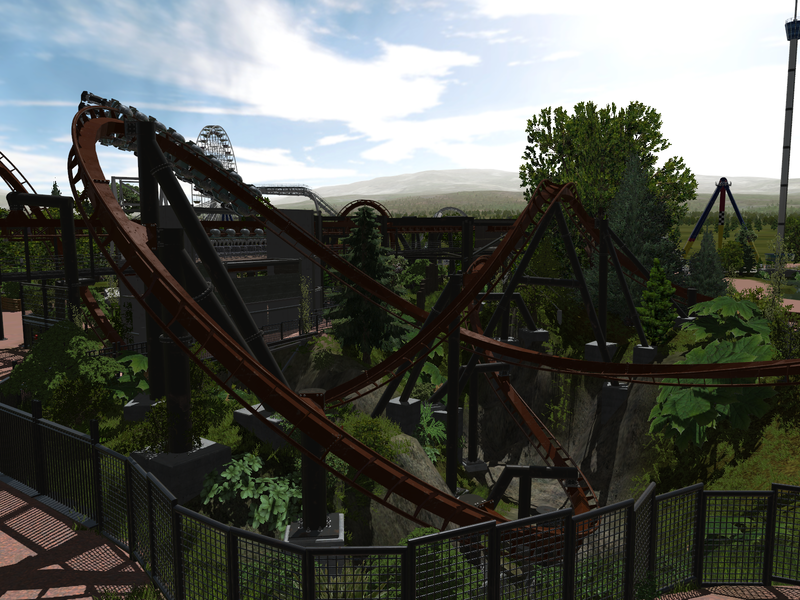 I've been using most of what little spare time I have to work on this park and my, have I made progress since the last update. 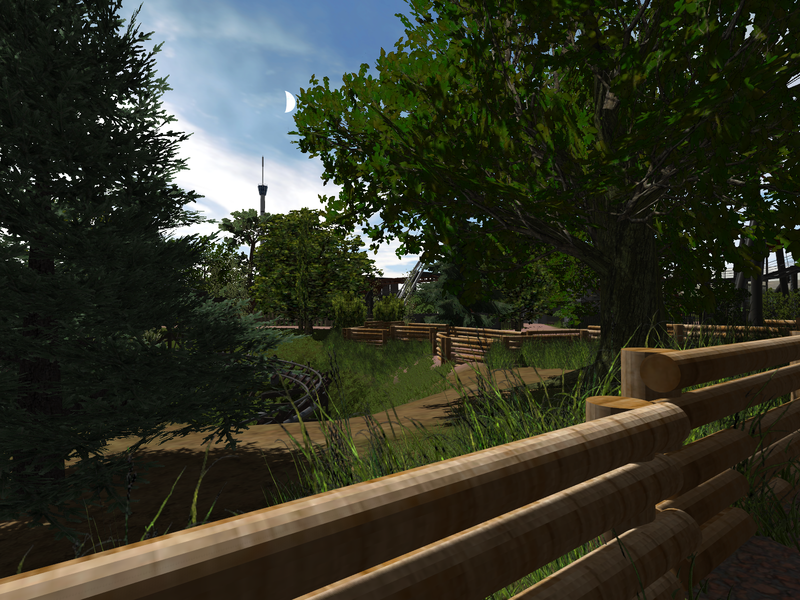 The park is beginning to take shape now, with themes being applied to areas, and paths mostly paved. I savor all of these latest photos! Awesome job! You really got my interest! Just one thing, how is the park running? Those fences, while excelent models, seem to have a lot of polys. This is looking absolutely fantastic! ^^ It's running surprisingly well. 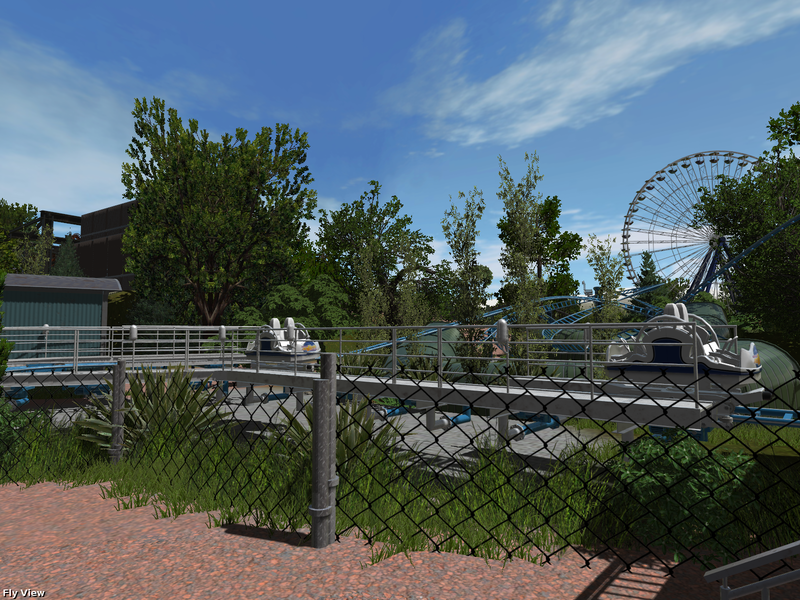 I've added tonnes of clipping to all the 3d's and some of the shrubs to help ease the load of the park. 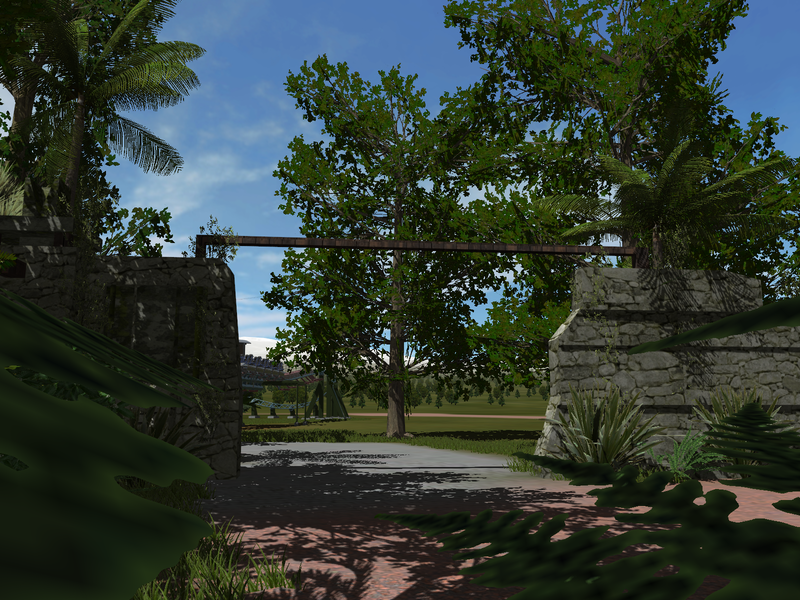 I'm trying to make it so that if you can't see it its not there, so a lot of the things have a fairly short clipping distance, but because at walking level you can't see too far into the distance anyway, the pop-in is mostly unnoticeable. I've tried smoothing it in sketchup but it didn't work too well (still exports with quite a few polys). Looks like an excellent park, the invert especially. I love the helix on it. 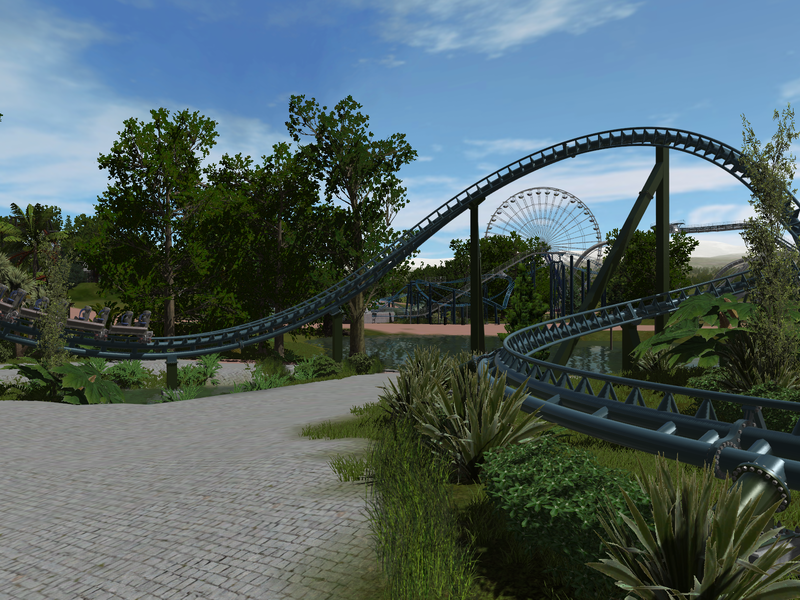 Great stuff Bouncy - as always I think you do a really good job of tieing everything into your park! Nice rocks at the lakefront.